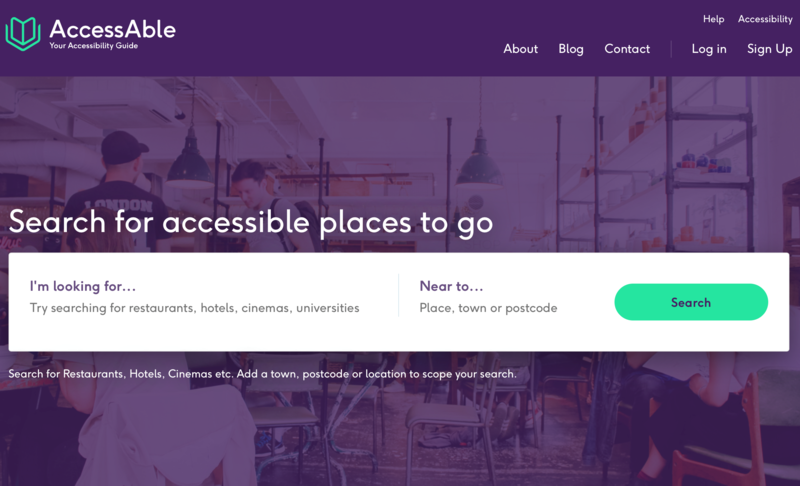 First of all, decide which type of venue or area you would like to visit, then head over to www.AccessAble.co.uk or download the AccessAble App in the App store. 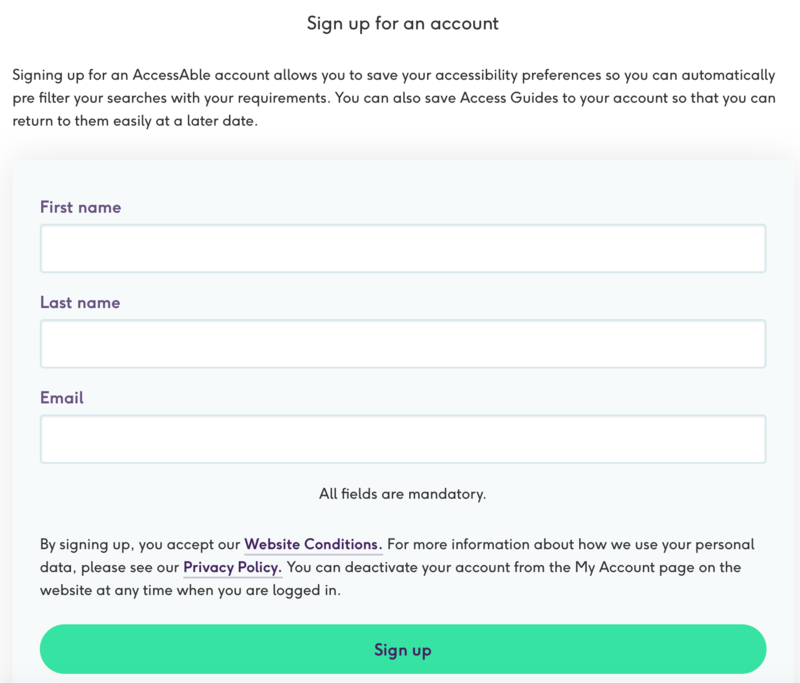 Signing up for an AccessAble account allows you to save your accessibility preferences so you can automatically pre-filter your searches with your requirements. You can also save Access Guides to your account so that you can return to them easily at a later date. On the homepage, enter the venue name/type of venue and destination you would like to visit and then click search. 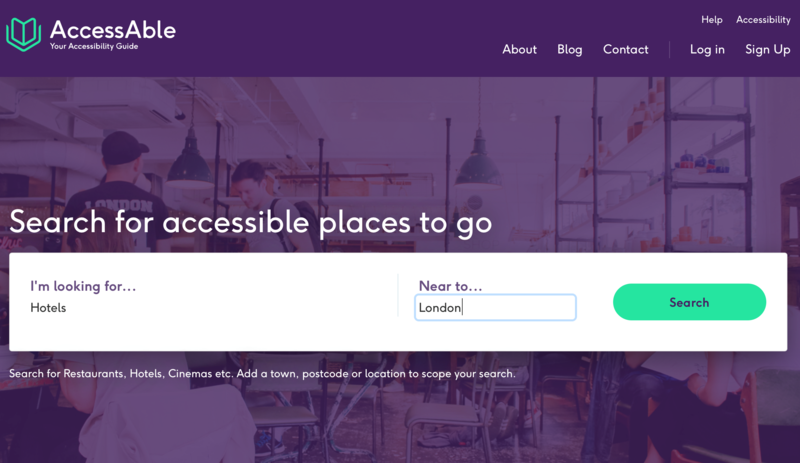 Our example is looking for Hotels in London that have Detailed Access Guides. You can also explore by area, just enter the town or city and click search. 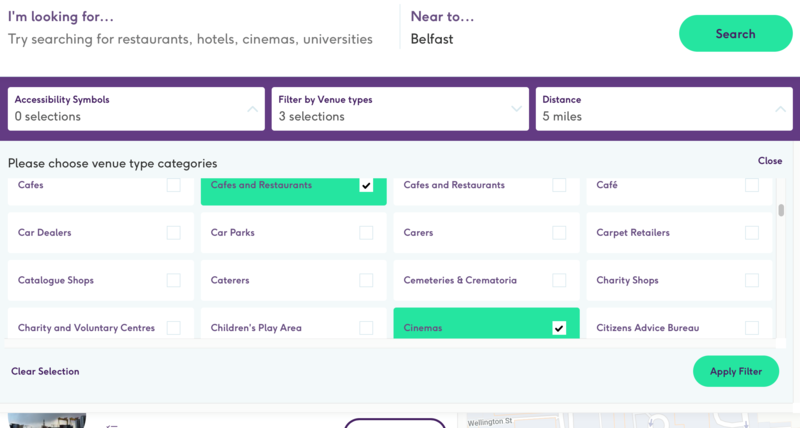 You can then discover some of our top featured guides or filter by venue types within that location e.g. restaurants, cinemas, tourist attractions etc. If you cannot find what you are looking for, it may be that we don’t work in that area yet. 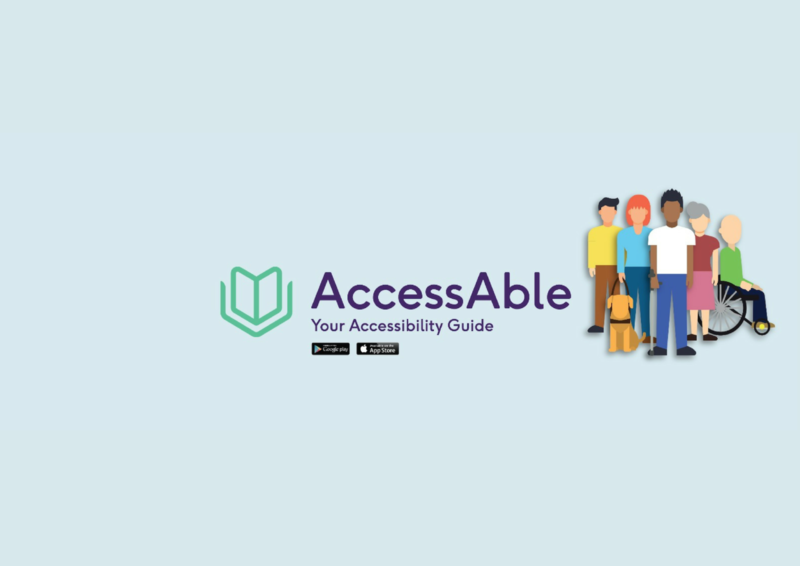 AccessAble uses 32 Accessibility Symbols and you can use these to narrow your search by filtering your results to match your accessibility requirements. If you have an account, you can save these for future searches. To understand what all our symbols mean, you can find them here. 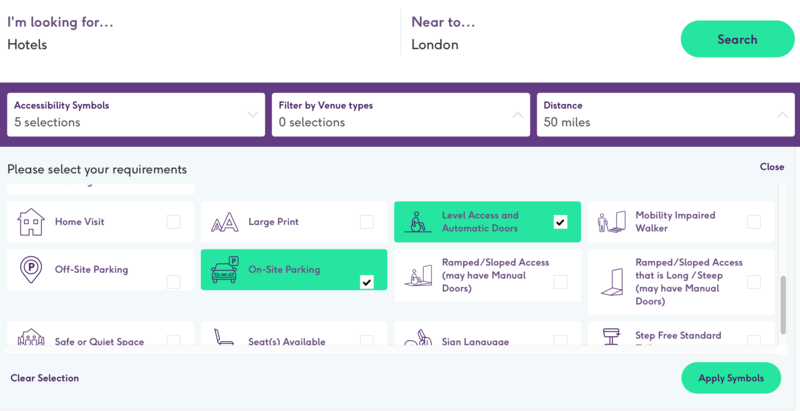 Example: We have filtered to show hotels in London that have level access into the building, a fully accessible toilet and on-site parking. The Ramped/Sloped Access that is Long / Steep (may have Manual Doors) symbol cannot be used in conjunction with other symbols relating to access into the building. The ‘On-Site Parking’ and ‘Off-Site Parking’ are not awarded in conjunction so you should filter by one or the other. Please remember the filter will only show the Access Guides which match all the symbols you have selected. 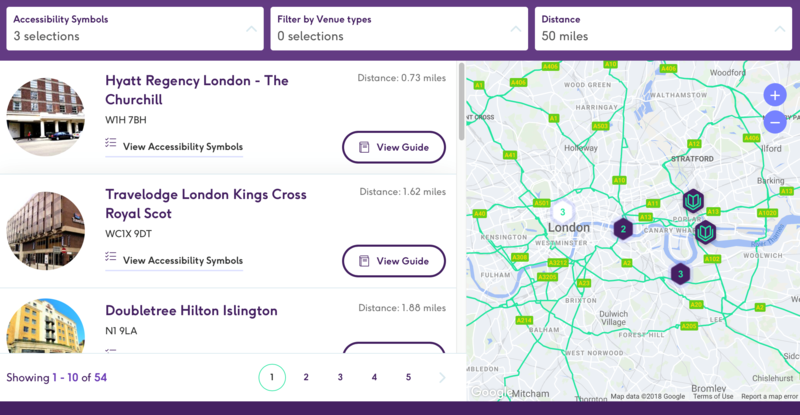 Scroll through the Access Guides or use the map to find venues in the location you want. Then click on the ‘View Guide’ button to find out more in-depth information. 6. Have a look through the detailed part of the Access Guide to find the information that’s relevant for you. Our Access Guides have a huge amount of information in them as we know that everyone needs to know something different. To make it easier, each section of the venue has a specific title e.g parking, lifts, accessible toilets etc. 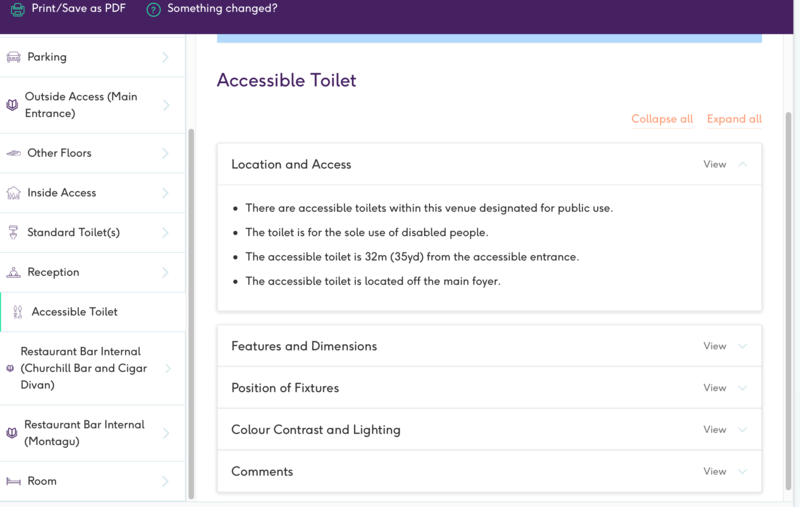 If you want to know something in particular, like more information about the accessible toilets, scroll down to that section, click to open it up and all the detailed information will be there. 7. Finish reading the Access Guide and enjoy your trip! We hope these tips will help you find the much needed accessible information! Feel free to send us photos of the places you have visited on Twitter and Facebook!